We’d love your help. Let us know what’s wrong with this preview of Sense and Respond by Jeff Gothelf. In illuminating and instructive business examples, you’ll see organizations with distinctively new operating principles: shifting from managing outputs to what the authors call “outcome-focused management”; forming self-guided teams that can read and react to a fast-changing environment; creating a learning-all-the-time culture that can understand and respond to new customer behaviors and the data they generate; and finally, developing in everyone at the company the new universal skills of customer listening, assessment, and response. To ask other readers questions about Sense and Respond, please sign up. Having read Lean UX, I was expecting a good book on how organisations could deliver projects. This book is about much more than that. The authors are coming from a point of frustration where agile delivery and Lean UX projects have failed to reach their potential because the organisations surrounding them were not supportive, so this book is about how to reshape an entire organisation to meet the challenged of the modern world, with lots of positive and negative examples, which is refreshing to Having read Lean UX, I was expecting a good book on how organisations could deliver projects. This book is about much more than that. The authors are coming from a point of frustration where agile delivery and Lean UX projects have failed to reach their potential because the organisations surrounding them were not supportive, so this book is about how to reshape an entire organisation to meet the challenged of the modern world, with lots of positive and negative examples, which is refreshing to see in this type of book. If you've ever had a strategy meeting, or ever found your project success limited by your organisation, go read this book. The book you wish your CEO would read. And your manager. And your colleague. All your colleagues. The ideas expressed in this book are not new. Not revolutionary. Not mind blowing. Instead, the book takes ideas practised by individual contributors and showcases them for managers. Jeff and Josh use simple words and avoid going into great detail. Thanks to that the book's message is clear and actionable. The great thing about "Sense and Respond" - it's not yet another prescriptive ™ methodology. It The book you wish your CEO would read. And your manager. And your colleague. All your colleagues. The great thing about "Sense and Respond" - it's not yet another prescriptive ™ methodology. It doesn't say: "Follow these instructions and you'd succeed". Rather, it acknowledges all the different circumstances and paths to success. It encourages readers to try out things, sense what works in their context and build on that. Ta książka to próba wysokopoziomowego przedstawienia, w jaki sposób możemy wykorzystywać i łączyć różne techniki/metody (Agile, DevOps, Design Thinking, Lean Startup, Jobs to be done) na każdym poziomie firmy, aby stworzyć nieprzerwanie uczącą się, zwinną organizację (zarówno projektowo, jak i operacyjnie), która jest w stanie stale dowozić wartość dla klienta. Miejscami sporo "oczywistości" dla osób pracujących blisko produktu, natomiast na plus sporo case studies z wdrożeń konkretnych procesów Ta książka to próba wysokopoziomowego przedstawienia, w jaki sposób możemy wykorzystywać i łączyć różne techniki/metody (Agile, DevOps, Design Thinking, Lean Startup, Jobs to be done) na każdym poziomie firmy, aby stworzyć nieprzerwanie uczącą się, zwinną organizację (zarówno projektowo, jak i operacyjnie), która jest w stanie stale dowozić wartość dla klienta. Miejscami sporo "oczywistości" dla osób pracujących blisko produktu, natomiast na plus sporo case studies z wdrożeń konkretnych procesów. I say that because if you're the former, the approaches and techniques as they're outlined here are going to be no-brainers to you. The authors talk about the concepts of "big data" and testing in a "sandbox" - you already know these terms, as well as how to keep a tight feedback loop w/ customers and adapt to that insight. However, if this is all new to you, or your company, it's worth a read or at least sharing around. It shows the benefits that legacy players got from shifting to iterative development approaches. 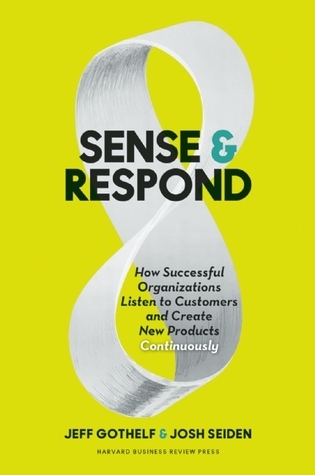 Sense and Respond builds on the Lean UX book, tunes the message to the HBR crowd and shares (or borrows) key influences from Lean Enterprise (Jez Humble et al) — DevOps and continuous delivery, portfolio management, etc. Gothelf and Seiden do a pretty good job of synthesizing several threads in the growing overlap between business strategy, technology and human-centred design. This would be the first book I'd recommend to someone coming from one or two of those areas who wants/needs to think and Sense and Respond builds on the Lean UX book, tunes the message to the HBR crowd and shares (or borrows) key influences from Lean Enterprise (Jez Humble et al) — DevOps and continuous delivery, portfolio management, etc. Good work and great stories, as always by Jeff and Josh. Why three stars? Because it felt unbelievably repetitive. It was the same point made again and again and again, with barely any variety. Good place to pickup a few stories though. My favourite is the recipe magazine that used lean startup and design thinking principles to slowly build a great web-based product! The secret to their success? They HAD PERMISSION TO FAIL by their management, if they failed small. It's a good book, don't get me Good work and great stories, as always by Jeff and Josh. It's a good book, don't get me wrong. But it does feel like "build mechanisms to listen to your customers (sense)", "start small" and "don't plan, learn (sense) and respond" should be known and a given in 2018. I read this book for work. It helped me understand how IT has been absorbed by technology and business leaders. It is unfortunate for people like me who enjoyed the command line work of IT. That work style of command line automation has been left in the dust. The old days of laughing a lot during the day at work, has been replaced by people being extremely serious and concerned about how much money is going to be made on every task performed. The IT world is now run by the C Suite, and people wh I read this book for work. It helped me understand how IT has been absorbed by technology and business leaders. It is unfortunate for people like me who enjoyed the command line work of IT. That work style of command line automation has been left in the dust. The old days of laughing a lot during the day at work, has been replaced by people being extremely serious and concerned about how much money is going to be made on every task performed. The IT world is now run by the C Suite, and people who don't know IT. It is run and managed by people who know how to push business to make more profit. I don't recommend this book unless you work in the industry. It would most likely be a boring read. Watch when users don’t use the product as expected and ask them why. Create landing pages with message, cost and email input for waiting list to gauge interest. Place value on customer behavior as a measure of progress. Personalities invested in their own ideas will have a hard time wanting to listen to the market, gather evidence, and find the best idea, regardless of source. Outcome not output. Many good and bad examples from the market to illustrate the difference between companies to do and don't understand the importance of two-way communication with the market. This book embraces the idea of collaboration, making over debating, and continuous improvement in general. If you are already working with a modern, agile software process (possibly already using ideas from Lean UX), you won't find surprising things in this book. Otherwise it's a good overview how to go beyond team focused agile. Sense & Respond is essentially a high level guide to software development for _all_ companies (regardless of if you classify your company as in software development or not). Giving 5 stars but I think it is heavy overlapping with Lean Startup by Eric Rice. If you liked Lean Startup book then you will find this one as an extension with more corporate context. I found nothing new in this book. This was a very light meal. Also, I am not a fan of books that ram a catch phrase down your throat—that’s exactly what “sense & respond” is, a catch phrase. Amazing book to ignite changes on management and product teams. Probably a good read if you don't listen to customers or create new products continuously.